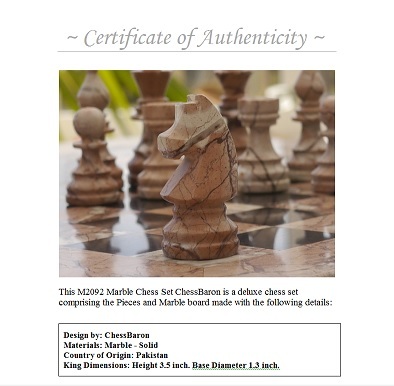 The luxury chess sets we have are also supplied with a Certficate of Authenticity. The chess sets we provide are highly valued and may in some circumstances be insured. The certficate could be used for such a purpose - although the dollar value may have to be specifically requested from us - which can be done at any time. The document will detail the set purchased, the date and the description as it appears on the site. If this changes in the future, you'll have an accurate record of what your purchase was - something you can pass along with the set in the event of as future sale or a transfer in the family. Please note that the insurance valuation for a purchased set would normally be much higher than the amount you have spent with us. Our prices are lower than most stores, and therefore a replacement chess set is likely to cost more, at least if the replacement was from another store. The certificate comes on headed ChessBaron paper and a copy will be retained by us too. Future enquiries can be made with appropriate discretion to our company. Please contact us for more info, or browse the chess set products.